“Pa-cheeen-tsa… pa-cheeen-tsa!” repeated my wife’s Sicilian grandmother, before we were married. (This is as close as I can come to transcribing her pronunciation of the italian word for “patience”). This is a sequel to Don’t even Think about it, discussing the importance of your spouse being on-board with the extended missions involvement that you feel God is calling you to. If you haven’t read it yet, it might be helpful to begin with that post and come back to this one. 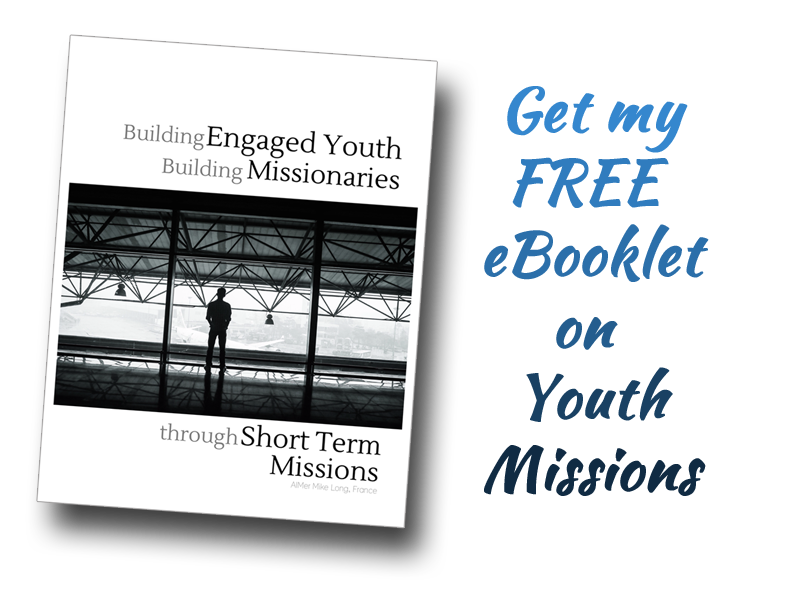 That God called me to a greater involvement in foreign missions is not so surprising. In fact, my wife likely feared that this day might come (the word ‘fear’ is intentional), yet as we prepare to go, she is 100% on-board. How did we get from “I fear it” to “I’m all for-it”? Over the past twenty years, I had spent a great deal of time in France between personal travel, study for my Master’s Degree and ministry involvement. It was no secret that I had a love for the country and the culture. My wife, on the other hand, grew up an Italian in Belgium (a country that the French typically make fun of), so there was familiarity but no particular affinity. Liz moved to Canada after we married and in doing so, uprooted her entire life (friends, family, cultural and institutional familiarity, etc. ), something I both admire and respect. Given that it was such a huge sacrifice, I had said repeatedly that I would never again ask her to do that unless it was very clearly the will of God to do so. Different ministry opportunities had presented themselves, and although some would’ve been appealing in terms of autonomy or adventure, none were of the Lord. When we would discuss these possibilities, I was careful to reiterate the guideline that I’d established…. that I would not ask her to uproot again unless absolutely convinced that it was clearly the Lord’s plan. Over time she realized that I meant those words. This built security in her. Even after I felt quite sure that the Lord was leading us to France, I refrained from discussing it with her for about three months. I also asked the Lord to speak to her during that time… to prepare her to receive what was solidifying in my heart. If it was of Him, He was well able to speak to her as He had to me. Before half of those three months had passed, she mentioned to me a desire to get some things in order (the house, bills, etc.) in case we would have to make any kind of move. In that, along with a few other things, I could see that the Lord was preparing the ground… and answering my prayer. We also limited the spread of what we were contemplating. Sometimes the more people are aware, the more pressure there is to move the process forward at a faster pace. For this reason, only a 1/2-dozen people, or so, were aware of our plan for nearly a year – people whose prayer life, walk with God and advice we trusted. Did you catch that? I said “nearly a year”. In fact… at the time of this writing, we have been formally in the process for fifteen months and still very few people are aware of our plans. By exhibiting patience (pa-cheeen-tsa) I have given the Lord time to speak into my wife’s spirit and given my wife time to get comfortable with the idea. They say that “slow & steady wins the race”. I have found that to be the case. By taking our time, it has allowed my wife to opt-in to the plan. It is something we are planning together. Rather than simply “her following God’s plan for my life” we are pursuing God’s plan for our life… together. Thanks Nonna… pa-cheeen-tsa! … it works!